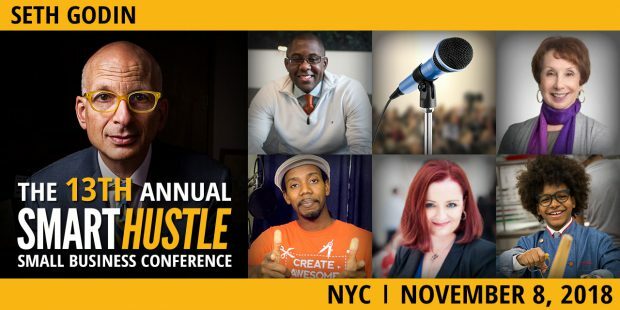 Last week I attended the 13th annual Smart Hustle Small Business Conference, hosted by Smart Hustle Magazine Publisher and Executive Editor, Ramon Ray. For those of you who know Ramon personally, or have attended one of his events in the past, you know that Ramon is a tech and small business evangelist who imbues his presentations with all the energy of an old fashioned revival meeting. He lives to help other business people succeed, and this intention is no more present than at his own yearly gathering. Do you know the difference between being an entrepreneur and a freelancer? Most small business owners and independent service providers consider ourselves entrepreneurs, but in reality, may of us are freelancers, including myself! Here’s the difference. As freelancers, we do the work ourselves. We offer a service, and we charge for our time and expertise. Entrepreneurs, on the other hand, build an asset bigger than themselves that makes money for them, which they can later sell if they like. Being clear on which one you are will guide you in every business decision you make. You build a customer base by going for the smallest possible viable audience. You gain their attention, and then earn their trust. This is really important when it comes to creating your marketing materials. Don’t be afraid of being specific! In carving out a place for yourself in the minds of your audience, rather than focusing on the authenticity of your voice, it’s better to shoot for consistency. Regular blog posts or newsletters that people grow to anticipate are a fantastic way of building loyalty and sustained interest. As marketers, we should begin everything by asking ourselves, "Who am I making this for, and what is its purpose?" We may think it’s a great idea, but more importantly, we have to solve real problems for real people. Self-compassion is key to being a successful entrepreneur or freelancer, as most of us are operating with scarce resources and time. We have to be kind to ourselves as we make the inevitable mistakes that everyone makes, and allow ourselves to move through our fear by welcoming it and working with it. If we use our fear as a compass, we end up doing better and more generous work that has the potential to be truly remarkable! Here’s a great tip for freelancers: Keep a set number of clients, and establish a policy that you’ll only take new ones when you fire old ones. If you make this known to both current and future clients, you’ll keep the old ones in line and create a huge demand for your services among those who are waiting for you. When offering your services, sales trainer Adrian Miller says to always keep in mind the value add. What unique thing are you bringing to the table that is of significance to your customer? What problems can you solve for them? Keep these things in the forefront of your mind and in all of your communication, and you’ll be more likely to open up a fruitful dialog. When pitching your products or services to prospective customers, Laura Allen recommends to always be clear about your call to action. As you establish this initial communication with them, think about what you are asking them to do, and then offer an easy channel to make it possible for them to act! Have you thought about YouTube videos as a way of connecting with your audience? Roberto Blake offered some great tips on using paid and organic video content as a lead growing strategy. By finding out what your audience needs and giving it to them, you open up a terrific channel to get feedback and engage viewers in helping them reach their goals. He offers this free guide to using YouTube videos as part of your sales strategy. When creating a company, make sure that people feel welcomed, and that your culture reflects the local environment. This becomes particularly important when you are scaling and expanding to other regions. Micromanaging is definitely not a recommended management technique. Rather than steamrolling through troublesome situations to impose solutions, try helping people to solve their own problems. You’ll end up with more empowered employees and a more motivated team. Personal energy management is super important! When you feel your attention and focus dropping, take a break and walk around, get a cup of coffee, or meditate for a few minutes. It’s better to pay attention to these needs than ignore them -- you'll foster greater individual productivity and a better office mood all around. “Side hustles breed creativity and curiosity.” This is another one for everyone to remember! No one wants to feel like a slave to their job, and no owner should want their employees to feel that way. When people feel free to pursue their passions on their own time, they bring more general vitality to everything they do, including their work. Which leads us to her final bit of advice -- “Follow your passion. Connect with yourself, and then act on it. Challenges are part of the process…” Imagine what you could do if you harnessed your deepest desires in service of your business vision. This is the kind of potential that exists when you follow your heart. One highlight of the day was the honoring of the 2018 Entrepreneur of the Year Awards recipients. Congratulations to all of you! Plans for the 2019 Smart Hustle Small Business Conference are already underway! Click here for more information.